The 2015 NCB Premier League gets underway on Saturday with a collection of intriguing fixtures. Last year’s champions Cuckney begin their defence on the road at Kimberley. The Bears’ squad remains largely intact from 2014, but is bolstered by the arrival of James Hawley from Caythorpe. Kimberley finished in the middle of the pack last season and will continue to rely on their conveyor of young talent to improve on that position. Kimberley, who enjoyed a four wicket win in the corresponding fixture last season, will be without Sam Ogrizovic, who is preparing to recreate the journey his grandfather took through Europe to escape the Nazis. Runners-up Plumtree begin at home to Caythorpe, who finished fifth for the second year in a row. The home side have retained the services of Graham White and introduce Australian Nathan Rimmington as their overseas player for the season. Caythorpe, having lost former skipper Hawley, have tempted Josh Mierkalns back from his Radcliffe sabbatical and he will be joined by his brother Caleb. Perennial contenders West Indian Cavaliers head to Radcliffe-on-Trent looking to rediscover their 2013 form. Adnan Ghaus is their new professional signing but the Cavs’ nucleus remains unchanged and dauntingly familiar. Radcliffe’s squad also retains a familiar look from last year, with David Lucas returning as their professional, the departed Josh Mierkalns being replaced by Steven Mullaney when his Nottinghamshire duties allow. The NCB Academy side were the form team of the second half of 2015, and many of their players will be much improved for their experience last season. Paul Franks will continue to rally his troops, who will no doubt have the usual early growing pains as the new intake of players adjust to the level. They start with a trip to Ordsall Bridon, who like Radcliffe, retained their NPL place on the final day of last season. Aqab Ahmed returns and is joined by Pakistan U19 player Tabish Khan, whose recent call-up will delay his arrival by a couple of weeks. The 2014 South Notts League champions, Attenborough, return to the NPL with a home fixture, taking on Clifton Village. Matthew Cross, the only player in the NPL to have been at the recent World Cup in a playing capacity, will take on professional duties, while Simon Stanny swaps the Caribbean for the Village Green in the overseas role. For Clifton, the core of their squad return, although pre-season plans have been disrupted by a long term injury to prospective pro, Dan Birch. Notts’ Greg Smith is in line to replace him while Atizaz Khan fills the boots of last year’s overseas star, Shreyas Iyer. The day’s remaining fixture sees the newly rechristened Welbeck CC host the Bassetlaw champions, Farnsfield. 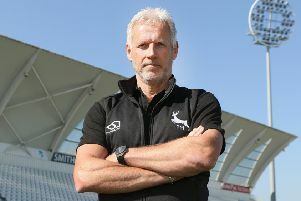 Tom Lungley joins from Rolls Royce to augment Richard Stroh in the pro stakes for Welbeck, who will also be able to call on Jake Ball when not needed at Trent Bridge. Farnsfield, who were unfortunate to be relegated in 2013, bounced straight back up last year, and look to augment that successful squad with the youthful experience of Brett Hutton and Sam Wood. It promises to be another interesting year in the NPL, and that interest gets underway even earlier this season as all matches are now scheduled to begin at noon every Saturday.